OH what a night! That was Ladies Night at Ayr Racecourse last Saturday as the rain stayed away and glamorous girls turned out in their thousands. There were hats in all shapes and sizes, dresses designed to brighten up even the dullest evening, and heels that should have carried a health warning. A crowd of more than 6,300 enjoyed a great night’s racing followed by entertainment from Counselled Out playing in the Ayrshire Suite and Midnight performing in the Horseshoe Bar. 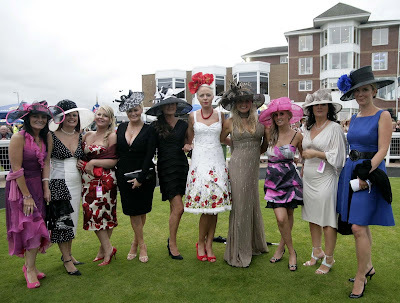 The night got off to a great start for hundreds of girls enjoying Hen Nights at the course when the aptly named Almost Married romped home in the first race at odds of 14/1. The champagne lawns were buzzing as the girls took advantage of a bright dry evening to sit outside and soak in the atmosphere of what is fast becoming THE social event of the year in Ayr. And at the end of the night, nine lucky ladies bagged a silver coin and a place in Ladies Day Final on 19 September when the top prize is a silver Alfa Romeo Spider 2.2 JTS convertible worth £25,000 courtesy of sponsors Kerr & Smith/Iveco Trucks, suppliers of commercial vehicles in South West Scotland. Second prize is a £3,000 white gold Vivienne Westwood necklace and ear-rings set with diamonds and pearls and is provided by Oghams the Jewellers of Ayr and Edinburgh. And third prize is a seven night Ocean Village cruise for two plus flights courtesy of Stewart Travel of Prestwick. Overall Best Dressed Lady on Saturday was Wendy Rattray of Glasgow who won a complete Beauty Makeover from KZ Hair. Other silver coin winners were Ann Marie Murray, Irvine; Linda Reynolds, Glasgow; Sharri Parker, Crosshouse; Yvonne Brown, Gourock; Gwen Cochrane, Kilmarnock; Audrey Thomson, East Kilbride; Alana Montgomery, Kilmarnock and Kate Godfrey of Dorset. 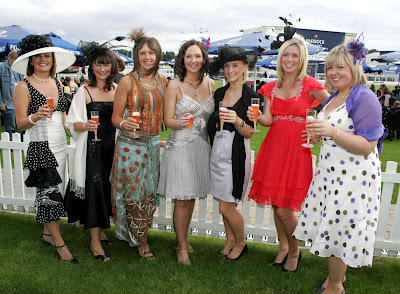 Ayr Racecourse marketing manager Lindsey Smith was delighted with the night. “We were so lucky with the weather”, she admitted. “All the ladies made a huge effort and a lot of thought was put into the various outfits, meaning the standard was the highest ever and our judges had a difficult time picking the winners. There are currently 319 Ayrshire business stories permanently archived on this site. To locate those of most interest to you, please use the site search facility in the top left hand corner of this page. Type your search term in the white box, then click “SEARCH BLOG”.